Extraordinarily diverse and colourful grasslands and grassy woodlands once covered extensive tracts of the NSW Southern Tablelands. At a first glance, a native grassland seems to lack interest - your initial impression is of a carpet of drab-coloured grasses. Closer inspection reveals many smaller broad-leafed and grass-like plants (forbs) growing between the grass tussocks. In near-pristine grasslands, such as those found on some country roadsides, village cemeteries or travelling stock reserves, the forbs can yield one of the most rewardingly colourful sights during Spring and early Summer. It is then that these wildflowers - daisies, peas, orchids, lilies and others - show themselves in their phenomenal variety. See these at the NSW Grassy Ecosystems flickr site for more photos, or get a copy of Grassland Flora from the ACT Government's Parks Land and Conservation. Each grassland or woodland site is seemingly different from the next. Botanists working in the Southern Tablelands have identified over 650 species of plants growing in grasslands and grassy woodlands (known collectively as "grassy ecosystems"). There are also many fauna species living in these vegetation communities - many are confined to grassy ecosystems, some are unique to the Southern Tablelands, and several species are threatened with extinction (see NSW Threatened Species Profiles). There are also a number of threatened plant species such as Tarengo Leek Orchid and Buttercup Doubletail Orchid. Grassy woodlands are usually open in structure, with a grassy groundlayer. The trees are most often Yellow Box, Blakely's Red Gum, Candlebark or Snow Gum. Shrubs are not a prominent feature in grassy woodlands, though surprisingly many species do occur. Grasslands may have scattered trees, but are most often treeless. Both grasslands and grassy woodlands in their natural condition are characterised by the non-grass species occurring in their groundlayer. These outnumber by far the number of grass species in good sites. Grassy ecosystems have seriously declined since European-settlement. This is because they occupy parts of the landscape that were favoured for the development of cities, towns, roads and railways. More recently, agricultural technologies have also seriously impacted upon grasslands. Some of these vegetation communities are now listed as Endangered, under Commonwealth, NSW and ACT legislation (see NSW Threatened Species Profiles). Grassy ecosystems are an important, if poorly recognised, part of our natural heritage. They play an important role in sustainable agriculture. We owe it to our descendants to conserve as many remnants of these uniquely Australian ecosystems as we can. A conservation management network has an important role to ensure the future of these communities. The CMN coordinator promotes communication between members of the CMN through a newsletter (see ST GE CMN newsletters: The Austral Bugle 1 vol 1 issue 1 (Winter 2002), Austral Bugle 2 vol 1 issue 2 (Autumn 2003) & Austral Bugle 3 vol 2 issue 1 (Winter 2009). The CMN coordinator may also provide assistance with protection measures and sourcing of funds, and maintains a database of CMN sites. The CMN database stores information about all CMN sites, including Southern Tablelands (NSW & ACT) sites on public lands that you can visit. The remnants of a CMN are not controlled or purchased by a centralised agency. Rather the existing owners or managers are encouraged to join the CMN and continue to manage the remnants, either as they have been previously, or with an increasing focus on conservation. By joining a CMN, a landholder or manager may make a commitment to manage a remnant at least partly towards conservation goals. Entering into one of the various available conservation agreements or applying for incentive or stewardship payments is an important part of this. In making such a commitment, significant individual contributions will add to others in the CMN, all accumulating to the conservation of the ecological community as a whole. Managing remnants is a sometimes difficult and often thankless task - though extremely important in our agricultural landscapes where native vegetation is most at risk. Several particular problems face managers of native remnants. One problem is to find the information needed to help make decisions. Would a change to grazing patterns enhance or degrade the remnant? Should burning be tried as a management tool? What species are present, and which are the most important? Are there any local sources of seed for restoration works? By joining a CMN managers or owners of remnants can draw on the experience of others, thereby gaining access to expert knowledge that may otherwise not have filtered through to them. A second problem is to find the resources needed to put better management practices into effect. Managers may require funding and help with writing applications. They may need some voluntary help to remove woody weeds. Remnants in the CMN will have a higher profile than those managed in isolation, the better to attract funds and other resources. Managing remnants in isolation may be difficult as it is difficult to know whether management efforts are worthwhile. Are others doing similar work? How does a particular site compare with others? By joining a CMN, land managers have the satisfaction of knowing that any contribution, big or small, helps towards the greater picture of conserving an ecological community and a landscape. A CMN formally recognises good land management efforts. Additionally, entering into more formal management agreements will ensure that the managers' visions for each remnant continues. From the point of view of scientists and people working in government and non-government agencies, especially those dealing with endangered ecological communities, a CMN allows us all to understand how well we are doing in terms of conserving these communities. The CMN model has been widely acclaimed and endorsed as an effective tool for the conservation of bushland remnants. The Austral Bugle 1 vol 1 issue 1 (Winter 2002), /Austral Bugle 2 vol 1 issue 2 (Autumn 2003) & Austral Bugle 3 vol 2 issue 1 (Winter 2009). Grassland Flora – a field guide for the Southern Tablelands (NSW & ACT) by Eddy, D., Mallinson, D., Rehwinkel, R. & Sharp, S. (available from booksales@fog.org.au ). Grassy Ecosystems Management Kit A guide to developing conservation management plans, by Sarah Sharp, Josh Dorrough, Rainer Rehwinkel, David Eddy and Anne Breckwoldt, and illustrated by Michael Bedingfield (available from the ACT Government's Park Conservation and Lands). 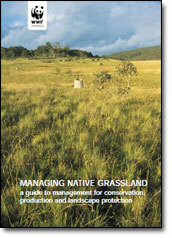 Managing Native Grassland: A guide to management for conservation, production and landscape protection by D. Eddy. Revision of PATN analysis of grassland associations within the Natural Temperate Grassland Endangered Ecological Community in the Southern Tablelands of NSW by R. Rehwinkel.